This is how the Diary of Anatoli N. Berezovoy, 51st Pilot and Soviet Cosmonaut, begins. Written between the 22 June and the 29 November 1982, it is an intimate and fascinating account of his experience as Commander of the Elbrus expedition during the 211 days (13 May-10 December 1982) on board the Orbital Space Station Salyut-7. In 92 pages of dialogue written "in the first person", Berezovoy, speaking directly to his wife Lidia, talks frankly and humbly about his life, his values, his dreams and his problems during his long stay on board, with which he, the Commander, and his Flight Engineer Valentin Lebedev, set the record for the longest space flight achieved at the time. The diary captures the uniqueness of living in space, the sadness of the solitude and the distance from one's family, the weight of daily tasks and the worry over health problems. It also traces a bitter account of the difficulties of surviving the breakdown of equipment on board and the misunderstandings with his flight companion and with those responsible for links between the Earth and the station. From the description given of radio and TV links, of the biological, geographical and astrophysical experiments and medical tests, you can perceive the cosmonaut's strong desire for the mission to succeed and the importance it holds for the development of Soviet and worldwide cosmonautics. A story that shares the feelings of pride and anxiety felt when hearing the communication on board that the flight would be extended, from 172 to 211 days, an absolute record in 1982, and at the same time the hope in the asking for the comprehension of his beloved Lidok (as he lovingly calls his wife Lidia). It is precisely with her that Berezovoy "speaks" in his pages, "talking" of his daily life, of his dreams upon returning, of their future together, of his love for his children, little Tania (Taniusha), 8 on the 15 of July, and his almost thirteen year old son, Sergei (Seriozha), of his passion for photography and for the "fantastic daytime and night-time past-time" that is observing the Earth from the porthole of the space station, of the anxiety and the joy, "a glass of cold water in the scorching steppe", felt upon the arrival of the supply craft and the subsequent opening of the bags containing newspapers, magazines and mail. In the history of space mail, with all probability, the first written correspondence between Space and Earth can indeed be traced back to Berezovoy. 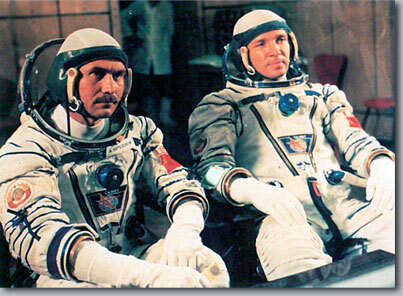 The Diary of Anatoli N. Berezovoy is an intense and emotional account that shows the real human side of "living in space".